Gary Neville has criticised Manchester United’s Daley Blind for taking the ‘easy option’ and failing to provide telling passes for the team’s strikers. 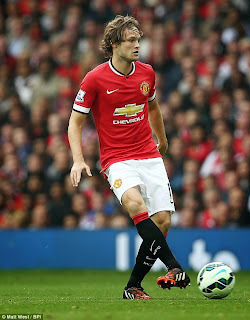 The Holland international has anchored United’s midfield since his £13.8million move from Ajax in the summer. But Blind and his new team-mates have made their worst start to a season since 1986 and are 10th after 10 games. Neville, though, feels the 24-year-old must start creating more for the likes of Robin van Persie, who has scored just three times this campaign. ‘He (Blind) has got to start looking up more and playing forward,’ said Sky Sports analyst Neville. Meanwhile, Neville defended Van Persie. ‘Van Persie is still making his clever movement,’ he said, ‘but I don’t think his team-mates are seeing him anywhere near as much as Scholes and Carrick were two seasons ago.